Love the look! Very nice with 2 different bands. The only thing I don’t like is the closing clasp. It is a personal choice. I do recommend it. 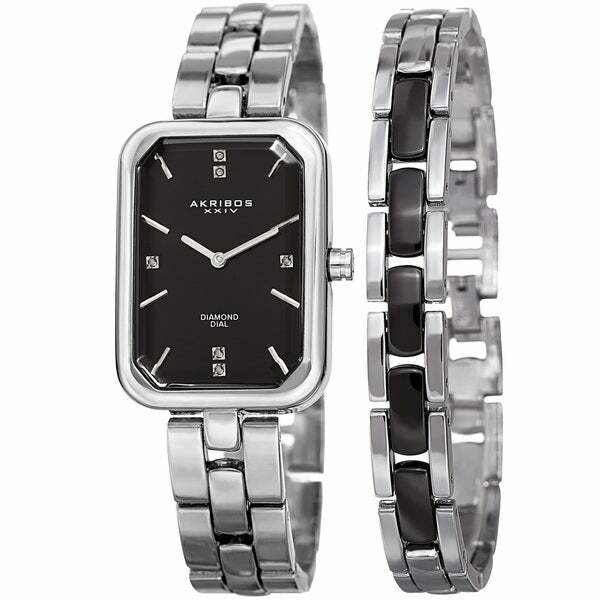 This lovely Akribos XXIV timepiece features a rectangular case with a high-set crystal. The radiant dial is adorned with dazzling diamond markers. This watch comes with a decorative bracelet that will have an undeniably fashionable presence on your wrist. It's a beautiful watch! I contacted the manufacture to get extra links, but they have yet to return my call or email. My daughter loved them both it made a very nice Christmas present.